Songs on the Side is a collection of contemporary compositions from intermediate to advanced level. The pieces are influenced by a wide range of artists, including Tool, Frank Zappa, Portishead, Charley Wilcoxon, Warner Bros., Paramore, Metallica, The Presets, Radiohead, Cold Chisel and more. 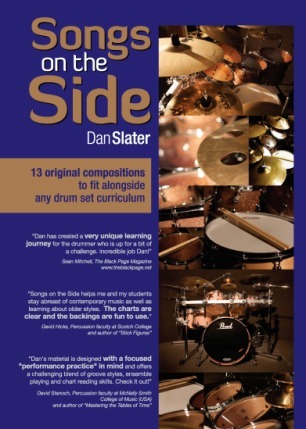 Many of the songs have been selected for study in ANZCA drum-set exams and Freedom Calling, Jazz Comping Solo and The Slightly Black Page can be performed in VCE drum-set exams.